Over the past five years, cloud technology has taken off. With cloud-based applications, disaster recovery planning, and data storage, the cloud offers a new architecture for businesses looking to improve efficiency and agility. Yet, new isn’t always better. While cloud storage certainly offers benefits to many businesses, some organizations are finding that using local storage – or a hybrid mix – is a more effective solution. Examining the benefits of cloud storage vs local storage is an important part of identifying what is right for your business. Cloud Storage Vs Local Storage: What’s What? Definition: Cloud storage is the process of storing digital data in an online space that spans multiple servers and locations, and it is usually maintained by a hosting company. Definition: Local storage is the process of storing digital data on physical storage devices, such as hard disc drives (HDDs), solid state drives (SSDs), or external storage devices, such as thumb drives or discs. In essence, the cloud simply provides an off-site, expansive solution for storage. Data Retrieval: Retrieve data from virtually anywhere and support work-from home initiatives, BYOD solutions, and business agility. Collaboration: By accessing the same data and tools, teams works together more efficiently. Disaster Recovery: Cloud providers can work with cloud solution platforms – like Zerto Virtual Replication 6.0 – to provide a disaster recovery and backup strategy. Subscription Pay: Pay-as-you-use subscription models take the CapEx model out of storage planning. “Green” Business: Businesses that switch to cloud computing can cut their energy consumption by up to 70%. Increased Capabilities: Virtualization, web applications, collaboration tools, disaster recovery solutions, centralization, data protection, and security protocols are all available to the cloud users. Security: IT teams need to be able to use cloud provider tools to ensure complete security of sensitive data. Host Trust: Risk management gurus note that teaming up with a cloud provider means you rely on them for availability and security. Speed: Accessing data stored on local storage is much quicker than uploading and downloading it to and from the cloud. Security Controls: You have complete control over how the data is stored, who has access, and information security protocols. Accessibility: That complete control comes at the cost of accessibility, which impacts usability and collaboration. Cost: The hardware and infrastructure costs are high and adding on more space and upgrading only adds to the price tag. Backup/DR: Off-site backups are an essential component of a strong disaster recovery plan. Local backups would be destroyed in the event of an on-site disaster. Cloud Storage Vs Local Storage: What’s Right For You? As with any technology decision, the best choice for you depends on your business goals. Many businesses today thrive with cloud storage vs local storage, since cloud storage is easy to deploy and maintain. More and more, though, businesses are finding a hybrid IT solution fulfils most needs. Using on-site local storage for certain tasks and backing up to the cloud is a particularly useful hybrid storage deployment. In this case, you have the benefits of speed and sensitive data controls while also enabling improved collaboration and data accessibility. This also speaks to the security concerns with the cloud. A strong security posture protects data assets. By assessing which data requires easy access or stronger security measures, businesses are better able to protect the data they rely on. While understanding the pros and cons of cloud storage vs local storage is useful in determining your starting point, building a complete roadmap that carefully plans out how data is stored and accessed in each of these types of storage is the vital next step. Mindsight’s expert data storage engineers will help you assess your current workloads and storage needs to build a roadmap that matches your business’ unique needs. 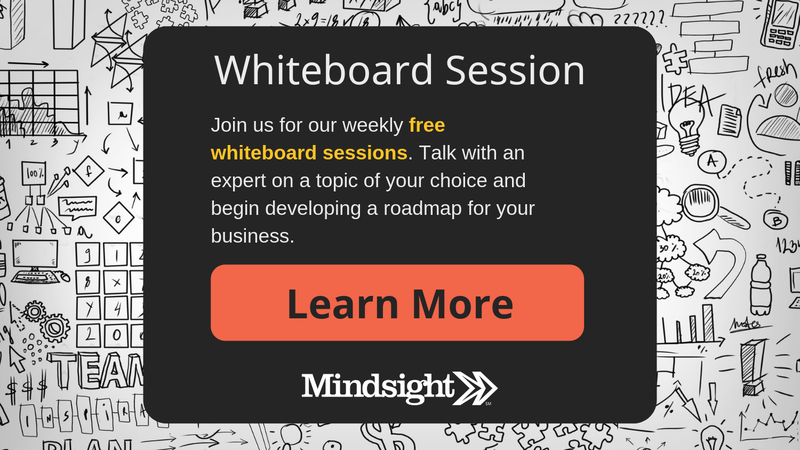 Sign up for our weekly Whiteboard Sessions for a free expert-level chat of your current environment, concerns, and possible paths forward. Contact us today to discuss cloud storage vs local storage for your business.